An illegal pesticide prone to drift has contaminated Monsanto’s Roundup Ready soy and cotton farms across ten states. What’s happening is terrible on many fronts with many moving parts … More and more growers are saying they’re getting less and less action from Flexstar, Blazer and Cobra [common pesticides]. And now this happens? Dicamba is the brainchild of Monsanto and DuPont, two companies which promote pesticide use with their genetically modified crops. This was likely a last-ditch effort to save Monsanto’s crumbling empire, since DuPont and Dow Chemical agreed to a $130 billion merger last year and Syngenta agreed to be taken over by ChemChina for $43 billion. Monsanto turned down a $62-billion takeover offer from Bayer, but its seed and chemical sales have both been declining. Sales of their best-selling herbicide have already dropped by more than 34 percent. 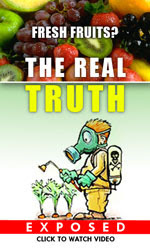 The pesticide is a combination of both glyphosate and 2,4-D. Largely in response to the failed herbicide created by Monsanto — Roundup — Dicamba was created with the intention of overcoming weed resistance experienced by farmers widely across the middle and southern states of the U.S.
A compliance advisory report released by the U.S. Environmental Protection Agency (EPA), says that there have been “unusually high” reports of crop damage that appear related to the illegal spraying of Dicamba. Missouri, alone, has suffered damage to crops on more than 40,000 acres, with complaints coming from 125 farmers. Alabama, Arkansas, Illinois, Kentucky, Minnesota, Mississippi, North Carolina, Tennessee, and Texas have also suffered crop damage from illegal Dicamba spraying. Moreover, some farmers decided to spray their crops with previous versions of Dicamba herbicide, which in many cases drifted and caused damage to neighboring conventional soybeans that were not genetically modified to resist Dicamba spraying. The latest version of Dicamba is supposed to be less prone to drift, but as the complaints mount, it becomes clear that this is not the case. Monsanto spent a reported $1 billion on a Dicamba production facility in Luling, Louisiana, to meet the demand it is counting on for the herbicide. The weed killer was created specifically to work on Xtend soybean and cotton crops. Ten states are facing drastic damage, specifically to these GM crops, but to non-GM crops through pollen drift, also. These genetically modified seeds created by Monsanto were planted on around 1 million acres in the United States in recent years. The complaints to the EPA report harm not just to Monsanto’s soy and cotton crops, but also to a number of additional crops, including peaches, tomatoes, cantaloupes, watermelons, rice, cotton, peas, peanuts, alfalfa, and soybeans. Though Monsanto’s crops were designed to withstand Dicamba, other crops were not. Pesticide drift is being blamed for the damage that has ensued. The EPA has not yet approved the spraying of Dicamba, but it is still being used. Farmers face $1,000 dollar fines for spraying it, even if it is over their own Dicamba-tolerant crops. A spokesperson from Monsanto, Duane Simpson, says that, “Monsanto, like all of you, is concerned about the damage we are seeing due to the alleged illegal misuse of pesticides” — but it’s hard to believe such a statement when their crops are made to withstand copious spraying with pesticides that cover more than 40 percent of crops worldwide. They are hardly shaking in their boots over crop failure. Monsanto also has an odious habit of suing farmers, even when pesticide drift happens due to their chemical and GM creations. Steve Marsh, who sued his neighbor, Michael Baxter, over the contamination of his organic farm due to GM canola drift in Australia, lost in court. Monsanto heavily financed Baxter’s legal defense. This is hardly the action of a company worried about contaminating organic and non-GM crops with their best-selling products. This article (Illegal Spraying of Monsanto’s New Pesticide Has Damaged Crops in 10 States) is free and open source. You have permission to republish this article under a Creative Commons license with attribution to Christina Sarich and UndergroundReporter.org. If you spot a typo, please email the error and the name of the article to [email protected]. Image credit: Wikimedia Commons/Pl77.